This is a book that I first read in Arabic, when it was published by a small independent publisher in Cairo in 2007, the novel which wasn’t allowed to be distributed by Libyan authorities inside the country, was handed over from one reader to another and became famous for its satirical criticism of the Qaddafi regime. 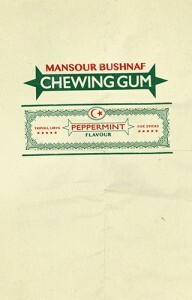 Now in its new resurrected form in English, “Chewing Gum” has proven to be one of the best novels in modern times to describe in a satirical, cynical style the Libyan society under tyranny. The novel’s absurd approach to many aspects of a society striving to live against political and social challenges, introduces us to the reality of despotism. Reading “Chewing Gum” for the second time in this excellent English translation, and especially after three years of Qaddafi’s demise, I felt that this novel will continue to be a must read to understand an obscure country and an isolated society that are still in the process of forging a nation that was fragmented under decades of colonialism, war, and dictatorship. « 2013 a year in pictures| 2013 عام في صور	» Alessandro Spina’s The Confines of the Shadow: A multi-generational series of novels set in Benghazi from 1912 to 1964.